Yesterday I discovered that if I caught a train from Parramatta to the Domestic Airport, it would cost me the equivalent of 56c/km. But when I catch the train from the station nearest my home to the Domestic Airport, it costs me $2.79/km. This newfound knowledge has me somewhat flummoxed. Some context for anyone not familiar with the geography of Sydney: my trip to the Domestic Airport from Parramatta – Sydney’s “other CBD” and the actual geographical centre of the Greater Sydney region – would cover some 30km. It would involve travel time of more than an hour, traversing at least a quarter of the Western Line of Sydney’s rail network to get me into Central Station, where I’d then need to change trains and head back out along the Airport Line to the Domestic Terminal. The train would stop at (give or take) eleven stations along the way – and that’s only if it’s “express”. If I mis-timed it, I could conceivably stop at twenty-three stations along the way, have to change trains more than once and who knows how long it would eventually take me to reach the airport. A one-way ticket would set me back a grand total of $16.80. Meanwhile, when I jump on the train at my home station, Bardwell Park, and head to the Domestic Airport it’s a 9 minute journey during which the train calls at all three stations between Bardwell Park and the Domestic Airport – all of 5½km away. So why is my journey to the airport only $1.40 less than it would cost me to get there all the way from Parramatta?! It gets even better. If I catch a train to the Domestic Airport from Mount Victoria – all the way out in the Blue Mountains, halfway between Katoomba and Lithgow – my travel time could exceed three hours, I’d cover a distance of almost 135km and a one-way ticket would set me back $20.20 – or the equivalent of just 22c/km. What’s with the massive inequity of pricing? Is it some arse-about message from Transport NSW to encourage use of taxis or private cars? Does Transport NSW have a policy of knowingly contributing to Sydney’s already heavily congested road network? Or is it all just some bizarre system of penalising those who live closest to the airport? There’s something wrong with this picture. In fact when it comes to roads and public transport in NSW, there’s something wrong with most of the picture and it’s been that way for a very long time. I’ve just spent a handful of days up on Queensland’s beautiful Gold Coast. The greater Brisbane and Gold Coast areas have a combined population of about 2½ million. 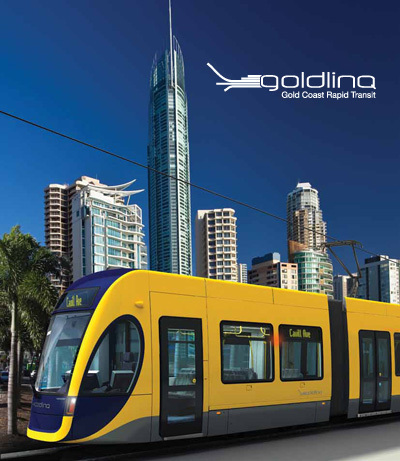 Almost for that reason alone, I was mightily impressed to witness the GoldLinQ light rail project well underway – Stage 1 will stretch 13km from Southport to Broadbeach, cutting right through the middle of Surfer’s Paradise. Construction started earlier this year and the project’s on track for the system to take its first passengers in 2014, with further stages to follow. A few days ago I also found myself taking a leisurely drive along the Pacific Motorway between Brisbane and Surfer’s Paradise. It’s eight lanes wide – ten in places! And it has numbered exits! Not just arrows pointing towards some arbitrary road or place (possibly useful if I already kinda knew where I was going), but numbered exits, just like highways, freeways and motorways in the US, the UK and Europe. The convenience and useability were self-evident. Fast forward three days and I’m back home in Sydney, a city with a population approaching 5 million. Suddenly I find myself surrounded by congested, narrow M roads – most of which I never use because, frankly, everything they lead to is just too far away. Most are no more than two lanes in either direction, three at a pinch; some have tolls; almost all have unintuitive signage conventions. I can’t help wondering if the likes of Queensland’s Pacific Motorway leaves them suffering acute performance anxiety. For example, right near where I live is the M5 East Motorway, a section of road that was commissioned just fifteen years ago. Large chunks of the M5 are two lanes in either direction. Then there’s the M4 Western Motorway. Commissioned in 1989, the M4 is a a giant stretch of road that starts way out west where the rain don’t fall – well, not very often anyway – and which ends more than 40km later at Parramatta Road (another of Sydney’s great carparks) in inner-western Strathfield. True, sections of the M4 are as wide as four lanes in both directions but, as with the M5, much of its length extends to a paltry three lanes either way. Then there’s the M2 Hills Motorway, covering more than 35km from the end of the Gore Hill Freeway at Artarmon to the beginning of the M7 Motorway out at Winston Hills – again, it was only commissioned in 1993 and it’s lucky to’ve been any more than two lanes in either direction over most of its length for the majority of its fifteen years in operation. These motorways were allegedly intended to alleviate the gridlock that was already suffocating much of Sydney’s road network by the 1980s and 90s. Yet somehow, as recently as only fifteen years ago, or even twenty-three years ago when it still couldn’t possibly have made sense, someone clearly put a convincing argument that it was perfectly reasonable to spend billions of dollars on roads so small that they’d be anachronisms before they were even finished. In 2012 that foregone conclusion is played out with monotonous regularity – both the original arterial roads and their intended saviours, the M roads themselves, are clogged to a standstill on a daily basis. Since the turn of the twentieth century, Sydney residents have been told endless fanciful tales of a transport nirvana, of boundless tracts of land given over to the world’s smoothest-flowing motorways, of the most überefficient and cost-effective networks of public transport, of grand plans to improve, enhance, transform or otherwise ’embiggen’ existing schemes. There’ve been promises of an extensive and efficient rail network, expansions to the west, to the north-west, to the south-west, to the Northern Beaches, to the Eastern Beaches… but where the NSW Government is concerned, it’s always been a case of short-term thinking. Way back in the 1920s the NSW Government wiped the entire planned Northern Beaches section of the city railway off the board, shelving plans to take the line all the way up to Palm Beach. Following electrification of the network in 1926, there’ve only really been four remotely significant enhancements to it. The first didn’t happen until 1979, the other three all in the last fifteen years… and even then, none of the most recent three could be described as being significant in a ground-breaking, earth-shattering, life-changing kinda way. Sydney also has an extensive bus network. Many years ago it had one of the world’s most extensive and efficient tram networks too – Sydney’s trams met an untimely end, due to yet another early example of short-sightedness on the part of the NSW Government, more than fifty years ago. Many of today’s bus routes are closely, if not exactly, aligned with old tram routes. 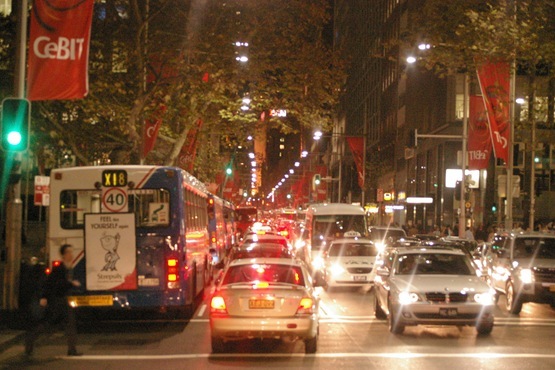 In the mid-2000s, when serious questions were raised about the efficiency of Sydney Buses and its contribution to congestion on Sydney roads, the powers-that-be took the very well thought-out decision to put more buses on the road. Anyone who has the utter misfortune of travelling by bus across the Harbour Bridge into the CBD of a weekday morning knows how much more efficient that well thought-out decision made the bus network; anyone with the utter misfortune of driving in the CBD along a bus route of a weekday morning knows exactly what a difference putting more buses on the road continues to make to CBD congestion. Who knows how much worse it will get? What will the impact on the rest of the city be if Nick Greiner’s grand plan for a light rail system along George Street, the very backbone of the CBD, somehow manages to come to fruition? It’s especially concerning given the likelihood that nothing will’ve been done by then to resolve the current stalemate on practically every other transport-related front. Something’s gotta give! So what’s to be done? How can we live in what’s arguably the biggest and best-known city in Australia and continue to evolve, to attract business and to attract the tourism dollar with such an extensive network of crap roads and crap public transport? Is it, as a friend suggested recently, political motivation – or more accurately, a lack of political motivation? For all the time and money it would take to ‘fix’ the problem in any meaningful way, what political powerbroker is likely to still be in Government by the time the work’s all been done and the original masterstroke is celebrated? And after all, what’s the point of using your influence as a politician to make stuff happen if no one will guarantee you’ll still be around to get the kudos for a job well done? Whenever I travel interstate, the point is reiterated time and again: every other capital city of every other state in Australia has more efficient roads, more effective public transport and a far better track record with making progress than Sydney does. This city continues to expand and new residents swarm in by the day… so when’s someone finally going to fix ours? This entry was tagged Airport Line, Brisbane, CItyRail, excessive ticket prices, George Street, Gold Coast, GoldLinQ, Light Rail, M2, M4, M5, M7, Nick Greiner, NSW Government, Pacific Motorway, Sydney Buses, Sydney transport, Transport NSW. Bookmark the permalink.